« How many doctors are there in the U.S.? Yep, English is modestly proportioned in the pie chart — largely thanks to a couple of billion Chinese. 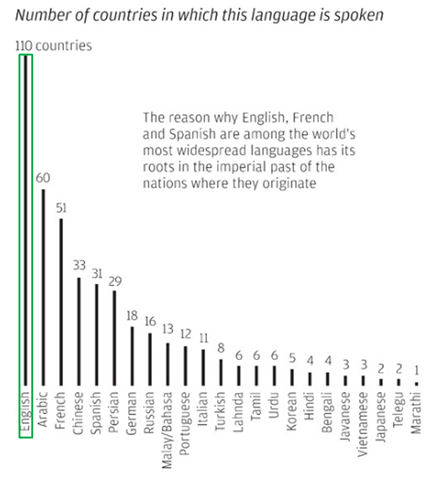 English is spoken in more countries than any other language … Arabic and French are far back in 2nd and 3rd places. English’s 1.5 billion “learners” is more than 10 times the sum of the next 4 most popular languages. So, the pool of priority immigrants would come from over 100 countries … and number at least 1.5 billion. That doesn’t strike me as so restrictive that Lady Liberty would lose any sleep over it. Sorry, Jim … you should have glanced at this infographic before relegating English to Great Britain and Australia. P.S. Do you know which is the international aviation language spoken by all pilots and air traffic controllers? And, the last time your call got routed to a call center on the other side of the world., how were you greeted? Thanks to MES for feeding the infographic. To see the exchange between Stephen Miller and Jin Acosta, click here. This entry was posted on August 3, 2017 at 6:59 am and is filed under Immigration, Language, Language - dialects. You can follow any responses to this entry through the RSS 2.0 feed. You can leave a response, or trackback from your own site.